ASCO · 2017, Le Tourneau C. et al. Background: Functionalized hafnium oxide nanoparticles (NBTXR3) have been developed as selective radioenhancers, which may represent a breakthrough approach for the local treatment of solid tumors. The high electron density of the nanoparticles, when exposed to radiotherapy (RT), allow the absorption/deposition of a high radiation dose within the tumor cells, to physically kill the cells and possibly improve outcome. A phase I trial was implemented for the treatment of locally advanced HNSCC in patients (pts) older than 65 years who cannot receive cisplatin. 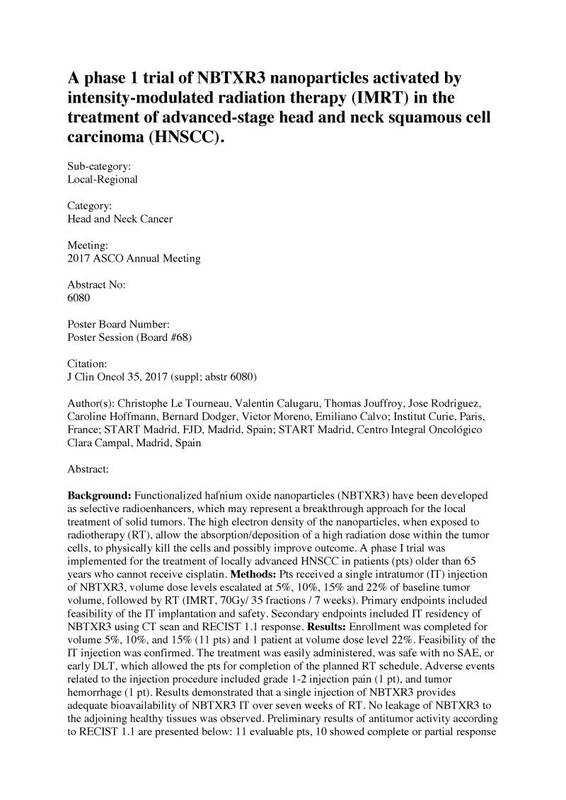 Methods: Pts received a single intratumor (IT) injection of NBTXR3, volume dose levels escalated at 5%, 10%, 15% and 22% of baseline tumor volume, followed by RT (IMRT, 70Gy/ 35 fractions / 7 weeks). Primary endpoints included feasibility of the IT implantation and safety. Secondary endpoints included IT residency of NBTXR3 using CT scan and RECIST 1.1 response. Results: Enrollment was completed for volume 5%, 10%, and 15% (11 pts) and 1 patient at volume dose level 22%. Feasibility of the IT injection was confirmed. The treatment was easily administered, was safe with no SAE, or early DLT, which allowed the pts for completion of the planned RT schedule. Adverse events related to the injection procedure included grade 1-2 injection pain (1 pt), and tumor hemorrhage (1 pt). Results demonstrated that a single injection of NBTXR3 provides adequate bioavailability of NBTXR3 IT over seven weeks of RT. No leakage of NBTXR3 to the adjoining healthy tissues was observed. Preliminary results of antitumor activity according to RECIST 1.1 are presented below: 11 evaluable pts, 10 showed complete or partial response (RECIST 1.1) including, 1/5 complete response at dose levels ≤ 10% and 3/6 complete responses at dose levels > 10% Follow up results with duration of response and tolerance will be disclosed. Conclusions: Injection of NBTXR3 was safe and well tolerated. All pts received the planned RT.